IT world splitting apart–value creation or damage limitation? Symantec: Creating two standalone businesses will allow each entity to maximize its respective growth opportunities and drive greater shareholder value. But on the surface this seems to be about separating along the lines of potential for high growth/high share (future stars) vs potentially low growth/low share (future dogs). In doing so it releases the future opportunity of value creation whilst limiting the damage derived from the constraints of the old. Security is a hot space, especially with the focus on “Cloud”. However whilst they are dominant in the end point security space this is going nowhere and the transformation (business and technical) required for the future will be significant. Information management however is ready to support the exploitation of the growing volumes of data that is being captured and stored. This need will only grow as we add more data into the storage bucket. They have known for some time that the Personal computing space is highly challenging (PCs and printers) and have come close to off loading this business line previously. Despite the recent positive news from IDC about PC shipments growing in mature markets (http://www.idc.com/getdoc.jsp?containerId=prUS24981914) there are still significant challenges ahead and others have already jumped into the space for new device form factors (Samsung and Apple). It seems highly unlikely that this business will scale the heights of yesteryear. Enterprise is always going to find value (vs price) in technology if correctly sold. The use of complex technology for business gain is no longer limited to large businesses. The cloud is democratising access and in turn expanding use to smaller organisations. This extends the definition of “enterprise” and creates further growth and market share opportunities. This entry was posted in Head Space. Bookmark the permalink. 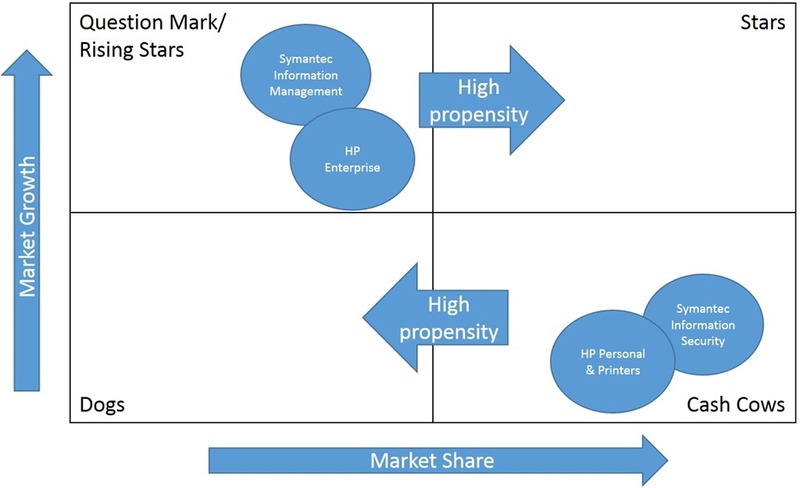 1 Response to IT world splitting apart–value creation or damage limitation? that over again. Regardless, just wanted to say great blog! When the going gets tough, the tough innovate.